Take my hand, hold it tight, laugh out loud, skip with me. See the light way up high shining bright within the sky? Don’t give up trust in me and you will see. Claps your hands to say a prayer. We’ve come so far, let’s move along, kneel right down to get back up. Stars will twinkle one and all. A moon of white shall light our path. 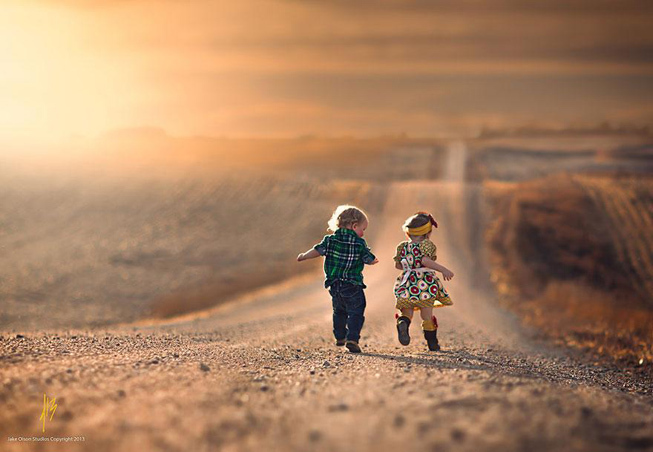 Boots of leather kick the road, pebbles scatter, friends forever…. In the distance candles flicker, melting tears in windows of crying homes. Curtains part hearing hearts begin to thump, skipping faster. Pickets of weathered fences weave to wave within prairie winds. Posted on December 2, 2014 by kcg1974 •	This entry was posted in Children, Poetry and tagged Children, Innocence, Lost, Love, Poetry, Searching, Trust. Bookmark the permalink. Oh, so happy to hear as I find poetry very difficult for me to write. Thank you truly for reading and commenting, You made my day! Blessings. Yes, Tess, rested well last night, knowing ‘my’ little children had slipped their well worn shoes and boots off, taken warms baths in silver tubs by the stove, and were tucked into feather beds by grateful loved ones. Happy Endings. Love to You. And love back to YOU. I love putting kitties to bed after warm baths and know they are safe and warm and well-fed. So kind, Mahesh. A true, “Thank You!” This picture stayed with me for days until I finally came up with words to accompany it. Don’t even want to think of how many times I revised it….my husband was beginning to think I was a bit obsessed. Lol. This image reminds me of the logo on Start-Rite shoes that i used to wear in the sixties. Prose seems like putty, being formed into something as the words whittle their way. Poetry is like a cut diamond, each facet reflecting something already formed. You cut a beautiful diamond. Thank you. A lovely poem from Kim Gosselin – always brings a bit of sunshine…. There is an overtone of spirituality in your well versed reflections kim . reminds me of the biblical joshua’s “be not afraid , for the lord is with you , wherever you go…” best wishes…raj . That was powerful! Love your poetry and images. Kim, I had fallen behind this month and apologize for this. I loved all the images of this poem you wrote. It is a very carefully written and beautiful expressed piece. It is artistic in its details and I liked the way you said, (these two passages were my favorite: the “kick some dust, cover your mouth” complete line and the “pickets of weathered fences weave to wave” complete line.) You’re a combination of poet and storyteller, which weaves magical stories with loving blessings within them.